Gallup has released new National polling data on the issue of abortion and the results are generally unchanged from the findings of previous years. Typically the Gallup poll has found in majority of Americans oppose all or most abortions even though some Americans who technically take a pro-life position opposing abortion wrongly think they are supposedly pro-choice. In the past, the Gallup survey has found that roughly half or just over half of Americans oppose all or almost all abortions. The newest polling data is no different. 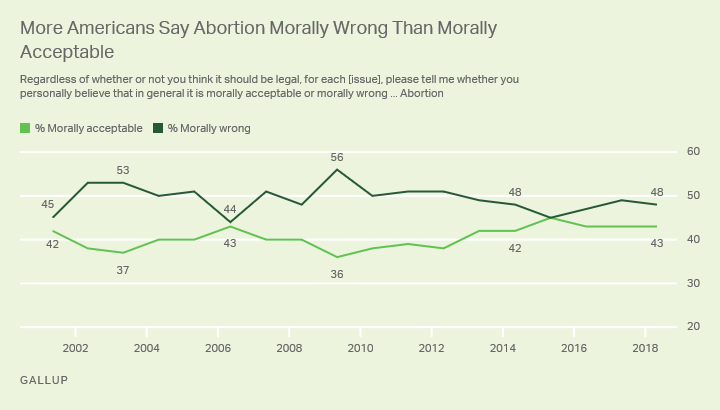 Americans also believe abortions are morally wrong — another consistently held view over the years. Abortion is also one of a more limited number of moral issues about which Americans’ views have not become more liberal over the past two decades.